NEW YORK Stocks closed lower on Wall Street as investors worried that a controversial proposal to seize money from depositors in Cyprus could set off another bout of anxiety over Europe's shared currency. The Dow Jones industrial average fell 62.05 points, or 0.4 percent, to 14,452.06 Monday. It had plunged as much as 110 points in the early going, briefly turned positive in the afternoon then fell back again in the last hour of trading. The Standard & Poor's 500 fell 8.60 points, or 0.6 percent, to 1,552.10 The Nasdaq composite dropped 11.48 points, or 0.4 percent, to 3,237.59. European markets recovered most of an early slide and closed with modest losses. Yields on government bonds issued by Spain and Italy edged higher and the euro fell to a three-month low against the dollar. The market rally that has pushed the Dow to record levels this year has been punctuated by concerns about the euro-region's lingering debt crisis. The Dow fell 1.6 percent Feb. 25, its biggest wobble this year, after elections in Italy threw the country into political paralysis, endangering crucial economic reforms. Can the stock market rise as the economy stalls? "Europe has got problems," said Uri Landesman, president of Platinum Partners, a hedge fund. "You could get more stuff like this and the market isn't priced to handle that." A weekend agreement between Cyprus and its European partners called for the government to raid bank accounts as part of a $20.4 billion financial bailout, the first time in the euro zone crisis that the prospect of seizing individuals' savings has been raised. The measures are stoking fears of bank runs in the other 16 nations that use the euro. Cypriot authorities, facing an uproar, delayed a parliamentary vote on the seizure and ordered the country's banks to remain closed until Thursday while they try to modify the deal to lessen the impact on small depositors. Markets in Europe and Asia also fell during early trading, before retracing some of their losses later in the day. Germany's DAX index dropped 0.4 percent and Spain's main stock index shed 1.3 percent. Indexes in Britain and France each lost 0.5 percent. The euro fell almost a penny against the dollar to $1.2954, touching its lowest level in three months. Gold climbed $12 to $1,604.60 an ounce. The U.S. stock market's reaction to euro zone developments has become more muted over time. The Dow slumped more than 8 percent last year between May 1 and June 1 on concerns that Spain and Italy would be dragged into Europe's debt crisis. While the Dow initially dropped last month in reaction to the Italian election results, it has since gained 4.6 percent. Likewise the market recovered much of the early loss Monday prompted by Cyprus's bailout deal. The yield on the 10-year U.S. Treasury bond, which moves inversely to its price, fell to 1.96 percent from 1.99 percent as investors moved money into low-risk investments. Yields on bonds issued by Spain and Italy, the two most vulnerable large European economies, rose but only slightly. Spain's benchmark 10-year yield rose to 4.97 percent from 4.91 percent, and Italy's rose to 4.57 percent from 4.55 percent. 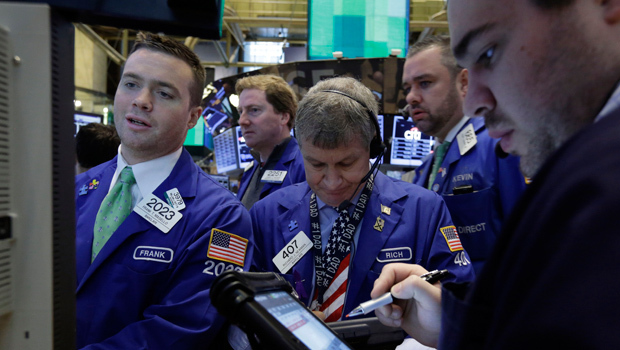 The stock market's resilience suggests that traders consider the Cyprus situation to be contained for now, said Quincy Krosby, a market strategist for Prudential. The threat of rising volatility may also deter the Fed from thinking about ending its economic stimulus program. The central bank starts its second two-day policy meeting of the year Tuesday. "Absent the Cyprus flare-up, the markets were slowing a bit and it looked as if investors were digesting the gains and waiting for the next catalyst," said Krosby. Financial stocks were the biggest decliners in the S&P 500. Investment bank Morgan Stanley (MS) fell 60 cents, or 2.5 percent, to $22.99. Citigroup dropped $1.02, or 2.2 percent, to $46.24. Goldman Sachs (GS) said Monday that it had lifted its end-of-year target for the S&P 500 to 1,625 from its previous target of 1,575. The investment bank is forecasting that the U.S. economy will grow 2 percent this year and 2.9 percent next year. It also predicts that corporate deals and dividend payments will increase. Deutsche Bank (DB) also said Monday it was lifting its year-end prediction for the S&P 500 to 1,625 from 1,600, forecasting an upturn in business spending. Schlumberger (SLB) dropped $3.06, or 3.9 percent, to $76.34 after the oilfield services company said that its first quarter activity was below its expectations as customers reactivated fewer rigs than forecast. Boeing (BA) fell $1.25, or 1.4 percent, to $85.18 after archrival Airbus signed its biggest deal of all time on Monday. The European plane maker won an order from Indonesia's Lion Air worth $24 billion for its short haul A320 and A321 jets.